Guidelines of MDM workers strike Alternative arrangement as per RC 121. AP MDM workers going to strike on 20-01-2017. 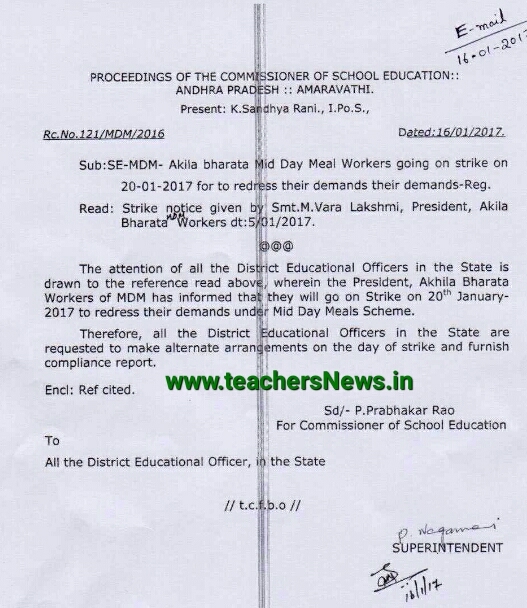 AP Rc.No.121, Fated:16-01-2017-Mid Day Meal Workers going on Strike on 20.01.17-Make alterative arrangement instructions to HM / Headmaster, MEO/ Mandal Education officer. Sub:SE-MDM-Akila bharata Mid Day Meal Workers going on strike on 20.01.2017 for to redress their demands.